The Principal's Principles | A Middle School Principal, striving to make the world a better place, one day at a time. Earlier today, my friend (and world class educator) Pernille Ripp posted the comment “How often do we assume that our admin will say no to our ideas rather than just ask?” I replied “too often,” and have been thinking about the exchange ever since. As a leader, I strive to be visible. However, “visibile” and “accessible” are not synonymous. It is important to be present, but it is more important to foster the kind of trusting relationship with people that allows them to share ideas or opinions. Anyone can be the leader who congratulates someone for a personal or professional achievement. The real measure of how much people trust you rests in how often or willing they are to come to you when they are facing a challenge or want to try something new. You only have “an open door policy” if people are walking in to talk with you about what is on their mind – good or bad. Take time over the next few weeks to reflect on the conversations you have with your people. Do they share the good and the bad? Do they propose a new idea? Focus on being accessible, which is a step beyond visible. The best ideas and innovations in our schools happen in our classrooms. Listen. Then listen. Then, listen some more. Reflect on what you’ve heard. If there is silence, ask why. For those reading who want to approach heir leader with the ideas that Pernille was referring to: We (leaders) want to hear from you and want to hear your ideas. If I could make some requests: please be up front, do you want to share an idea, or are you asking us to help you refine something? Please be open to the idea that I might need some “think time” after we talk, you’ve been thinking through whatever your sharing with me for some time, it’s still new to me. And, please take a minute and write it down, even if it is just for you. If you can write 1-2 paragraphs about your idea, it’s developed and ready to be shared. Lastly, please don’t assume how I feel about something because I ask questions. I’m trying my best to think through what you have shared. Pernille is right, your leaders want to hear your ideas. Let’s talk, together we’re better. This week, I had two learning opportunities that made me appreciate member of our staff and helped me see our school from a different perspective. The aide who supervises our breakfast program had to be out on Tuesday morning. With no substitute to fill in, I volunteered to take on her role. Arriving to school a few minutes early, I turned on the lights, made sure everything was set, and began greeting students. Our breakfast crowd drops in, and then heads out to he halls to socialize after they finish a quick meal. The chance to talk with students about their homework, what they watched on television the night before, or anything else on their minds was a positive shot in the arm to start my day. Unlike a lunch period, he small numbers allowed me to interact with every student. I walked away energized and thinking our breakfast aide has a fantastic job. Then I stepped back and reflected. As the person in our cafeteria, she is one of the first staff members our students see each day. She can literally make or break he beginning of a school day for so many of our students as she interacts with them and welcomes them to school. I was appreciative of this experience. I didn’t anicipate that today, I would discover our cafeteria team was short a person. I moved some appointments around and signed on to help. I spent 90 minutes putting food out, making sure we had enough of everything, guiding students through the lunch line, cleaning up spills and running trays to the dishwasher. 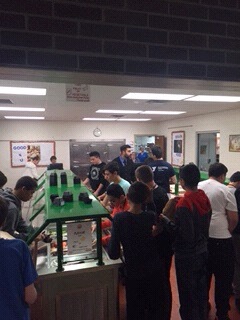 Hundreds of students pass through the lunch line, all with individual preferences and demands. 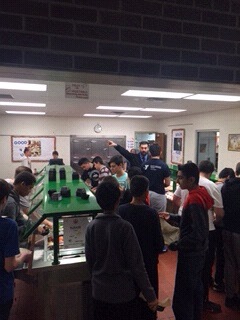 Our cafeteria staff is patient, efficient, and teamwork is key. They answer the same question hundreds of times, greet students with a smile, and don’t hear “thank you” nearly enough. We spend a lot of time as leaders talking about building and maintaining relationships with students. This week I had the chance to see how our food service department has the opportunity to have a positive impact on our students. I have always valued our support staff, but walking a mile in their shoes game me a deeper appreciation for their role in our organization. Many thanks to the ACSA and the NASSP for allowing me to be here. I’m appreciative of your willingness to spend some time with me today. News in Michigan over the past few weeks has featured water in the city of Flint. For those new to the story, first the water had an odor, then was discolored, and now there is evidence of lead. It’s a public health crisis; the blood-lead levels of children have doubled in some areas. I’ve followed this story as a father, horrified to know that some parents are facing the reality their children have lead posioning. I’ve followed this story as a citizen, angered by the failure of our state to address these concerns and provide proper city services (in America, you should have clean water coming from your faucet, no matter what your zip code). I’ve also followed this story as a student of leadership. In 2014, leaders of the city of Flint decided to move from the public water system they had used in favor of pumping water to residents from the Flint River. This move was part of a long term strategy to find a lower cost solution to providing water to residents of the finanically troubled city. Leaders failed to anticipate the pipes they would use to get the water from the river to the facuet were not up to the task. The water was corrosive and picked up lead from the pipes, endangering people. The water crisis in Flint is a reminder of the high stakes decisions leaders make, in the short and long term. Millions of dollars will be spent in the effort to overcome the medical and infrastructure problems that will result from the care for those impacted and the repair of the public water system. I have no data to support my position, but I believe that somewhere, there was a public service worker who anticipated this problem. The failure of leaders to hear from these people who knew far more about the water system caused them to make a poor decision. Did they fail to listen, did they fail to ask? Did they create an environment where staff members felt comfortable coming to leaders? Support is a two way street, as is comunication. As you head back next week to wherever it is you lead, ask yourself, have I made myself accessible to everyone? Do I hear everything? The good and the bad? Poor communication contributed to a poor decision in Flint and a public health crisis followed. As leaders, we must recognize the potential consequences of our decisions, and must maintain communication to have all the facts when we make a decision. Get the right people in the room, and be correct at the end of the meeting. As the school year begins to move from “we’re just getting started” to “it’s been a few weeks,” I’m reminded of two ideas. The first is the call for patience I wrote about at this time last year. Overall, I focus my attention on having a good week, 1 week at a time, to have a successful school year. The second idea comes from one of my favorite books, Influence by Robert Cialdini. The third principle of the book is “commitment and consistency.” Cialdini explains people are more likely to follow through with something if they state it publicly. I make time each day to make certain I am ready for whatever is coming. Meetings, events, logistics. In the quest to be prepared, I’m going to focus my attention on getting the right people in the room for whatever the conversation that needs to take place and to ask good questions. My goal is not to be the smartest person in the room, it is to ask the best questions. The best questions don’t seek to “get” or “catch” people. The best questions seek get more voices in the room, to inform, elicit expertise, and to grow the conversation around whatever topic is on the table. Reviewing agendas, going over documents, and spending time thinking about what is coming up will help me to be prepared with information and to ask questions. 2. Be right at the end of the meeeting, not at the start. We all walk into meetings with preconceptions and notions of what we want to see happen. As a leader, bringing a specific outcome with you to a meeting can move you from democratic to autocratic. Meetings become more about confirming your thinking and less about getting ideas on the table that can move your organization forward. You can miss creative ideas, and fail to develop people when your meetings become more about proving you right than thinking about an issue. I’m going to walk in to every meeting without a presumed answer, but only with the goal of listening to others and arriving at the best decision that aligns with the mission and vision of our school. These two goals will require me to listen more. I know what I think, what I need to know are the thoughts of everyone else in the room. There is also a value in letting others talk, it allows them to reflect on an issue and helps them grow. At the end of the day, I’m going to spend a few minutes reflecting on how much I talked and how much I listened. A great school year is the product of 40 good weeks, 1 week at a time. Literacy, it is what great schools do. I read your post with great interest, I’m always looking for ways to be a champion of literacy. It’s a simple idea, but I want our school to be a place where students grow as readers. I’m doing a lot of the things you wrote about (investing in books, talking about reading, promoting choice). I’m serious about working with our teachers to expand access to our Media Center. One of my proudest accomplishments at my last school was the “24 minute guarantee.” Students at our school read for at least 24 minutes per day on average in their ELA classes. I wrote about some of the work we’ve done in a post late last year. The best way to improve student’s reading abilities is to provide them time to read, choice of what they read, and to talk with them (we call it conferring where I am from) about what they read. No matter what tomorrow’s economy holds, reading skills will be central to every economic sector. Principals and ELA teachers should all have a copy of “The Book Whisperer” on their shelves, and should revisit it regularly to ensure we are doing what we should be doing. I read for fun, and I know you do too. I don’t know that we are members of the majority. Informational reading is key to that economic future I wrote about, and those skills need to be more of a focus area in all classrooms in our school. Choice is important, but so is the ability to sit down and read something assigned that you will be responsible to know about. I’m doing my best to engage our entire staff in a conversation about the skills we want our students to walk away from our school with. Unfortunately for me, this often sounds to our Science and Social Studies departments like I am saying “everyone is an ELA teacher.” That’s not what I am saying, and I could use some help from people such as yourself to reassure and support this idea. Talk with your colleagues, help them see the difference between the work you are doing and they work they are doing. Help them see where your work overlaps and how you can support one another. Make it a priority, don’t always wait for me to initiate the meting or the time to sit down. Last year, I saw and heard about ELA, Science and Social Studies teachers talking about writing. These are the conversations that need to grow, sometimes without me creating the time and space. I’d also love an invitation. I’d love to come and read with your group. I’d love to confer with some students about what they are reading. Thanks for the chance to talk literacy, together we’re better. This year, my message to our staff at our opening meeting came from a very personal place. Last week, a major milestone happened in our household; young Averie Bernia started a preschool program for three year olds and it was her first day. I’ve been a member of our profession for 12 years. I’ve walked new 6th grade parents to the door as they dropped their child off, providing countless statements of reassurance. I’ve said, genuinely, “we will take care of him/her” hundreds of times, and meant it every time. It’s just different when it is your child. As we walked across the parking lot, self doubt began to creep in. Have I read to her enough? Are her skills where they need to be? Is the school going to ask for something we haven’t provided? Have we as parents done all that we should to prepare her for today? For the record, she did fine. And for the record, I still worry whether or not I have done enough to make sure she is prepared. Parents more veteran than I that I’ve spoken with this week have said that doesn’t go away. I’ve made the statement before, but last week, as I walked my own child in to school for the first time, I really felt how true these words are. I’ve made this statement before, but last week, as I walked my own child in to school for the first time, I really felt how true these words are. I’ve made this statement before, but last week, as I walked my own child into school for the first time, I really felt how true these words are. As educators, we have a profound responsibility, one that I felt presonally for the first time this week. The students we will work with this year did not ask to be born and to be educated in a time when state policy and funding had gone beyond the point of absurdity. It is incumbent upon all of us to roll up our sleeves and get to work, to be the professionals we want to work with our own children. Do work you’re proud of. Let’s have a great year. For the first time in a long time, I’m starting the school year in a new place. In a new office, in a new school, in a new district. He’s spot on. It’s the first day of school, with a room full of professionals, all ready to get to work and all with a list of tasks to complete. I feel an added pressure for this to go well this year, I’m brand new. Before I get to the question, two details. – I’m working hard this month to meet everyone, my goal is to already know who people are before the first staff meeting. – I don’t like long meetings, and neither do teachers. This goal is a meeting that will be less than an hour – meaning some details will be sent to staff before the meeting so they can read the beginning of the year information. It is with all this information in mind that I turn to you, my fellow educators. Teachers, what do you want to hear from your new principal at the opening staff meeting? Principals, what did you, or will you say at your opening staff meeting? Judging from the website traffic and comments, our last exchange got people talking, which I saw as one of our goals (helping me grow as the other). With that in mind, I’m hoping we can talk about evaluations. As a disclaimer, the following paragraph is for context – I know you have a lot of tasks to complete. This isn’t a statement of “my job is harder,” rather just the requirements of my role. Evaluations are hard work. Last year, I was responsible to evaluate 19 teachers, 3 paraprofessionals, 2 secretaries, 1 counselor and our Assistant Principal. Each requires meetings, documents and timelines. Evaluations don’t happen in a vacuum, I am doing other work while these need to be completed. In every case, I strive to be authentic and make the process meaningful. I want to generate some self-reflection and help people grow as professionals through the evaluation process, which I value. This isn’t about state education policies, it’s about a process for me as a principal to help you grow as a teacher and identify areas where you need support that I can help to identify and provide. With that in mind, I turn to you as we try to close the gap. Realizing that evaluations are a lot of effort for both of us, what do you want, as a teacher from this process? How often do you want to see me in your classroom? Looking forward to continuing the conversation, together we’re better. I’ve struggled to find the words. In my recent exchanges on Twitter and through comments left for me here, I’ve been reflecting a lot on how to properly articulate what I see as my role as an administrator in schools when it comes to working with teachers. I made a clear statement “our jobs are different,” a week ago, but I neglected to make clear what my role is. Dan Hickey, the dean of school leadership in our area, calls on administrators to “support, coach and supervise.” He’s right, we need to play all three roles. My role is not to plan, provide instruction, create tasks for learners and to provide feedback to students on their progress. Teachers are professionals, and I need to respect their role and allow them to do the job they were hired to do. My role is to provide the time, space, resources and opportunity for our staff to do their best work.